The Penelopiad starring Megan Follows opens tonight at Buddies in Bad Times Theatre. Photo by Robert Popkin. FILM: This month’s Cinema Politica focuses on U.S. military torture with a screening of Doctors of the Dark Side. The documentary profiles four detainees and the psychologists and physicians who designed, facilitated, and covered up the torture program to which they were subjected. Bloor Hot Docs Cinema (506 Bloor Street West), 6:45 p.m., suggested donation $2–$10. 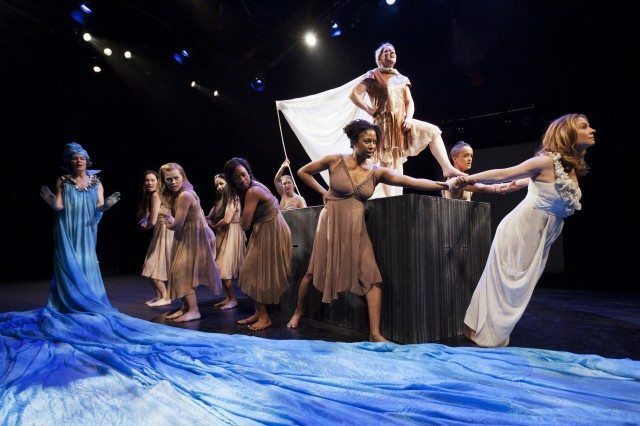 THEATRE: Tonight, Megan Follows stars in Nightwood Theatre’s The Penelopiad, Margaret Attwood’s witty and provocative response to Homer’s The Odyssey. Forced to spend eternity in Hades, Penelope recounts her life story and the murder of her 12 handmaidens by her husband Odysseus. Buddies in Bad Times Theatre (12 Alexander Street), 8 p.m., $38. COMEDY: In preparation for a big taping, Nick Flanagan is putting on a one-night-only Joke Club. Expect plenty of material about the YMCA (whatever that means), from both him and Canadian Comedy Award winner Tom Henry. The night will be hosted by Sarah Ford, a Laugh Sabbath regular. The Garrison, Front Room (1197 Dundas Street West), 9 p.m., PWYC.